Over stimulation and frustration can cause a dog to dig a hole, as can the need to bury a fresh bone and once that fresh bone is nice and rotten, it is time to dig it up. 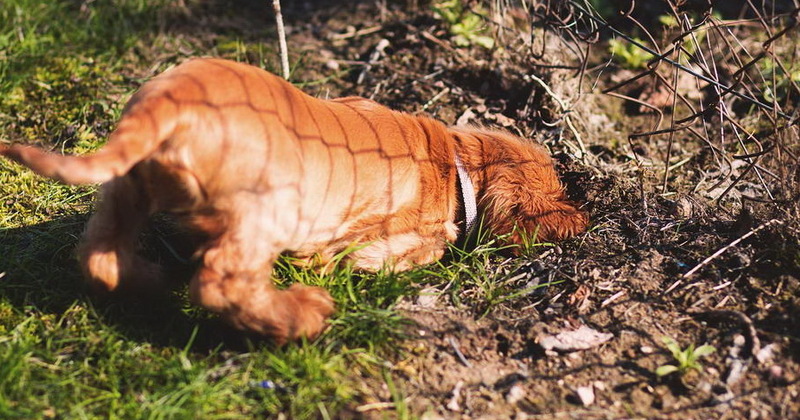 The first thing you need to ascertain is when and where your dog is digging and then find a solution. Sprinkler systems are often destroyed in the dead of night and usually just after the activation of the timer. A hot, humid evening brings out the insects and not all live above ground. Burrowing insects under pathways and in lawns create a cacophony of sound heard only by a dog. Digging along a fence line is generally because there is something on the other side that the dog wants to get to and if it’s not another dog it may be the creatures possibly inhabiting/visiting the neighbour’s shed. So keep an open mind when you discover your dog digging, there is a reason for it and a corresponding solution.